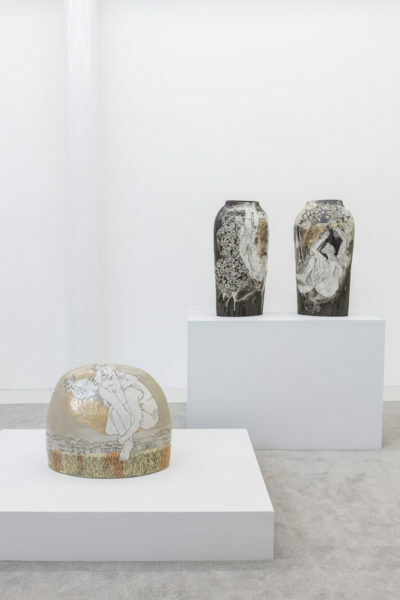 For her first solo-show in London, Sheffield-based artist Emilie Taylor has created a new body of work at Bosse & Baum that explores the maternal subject in the urban landscape. 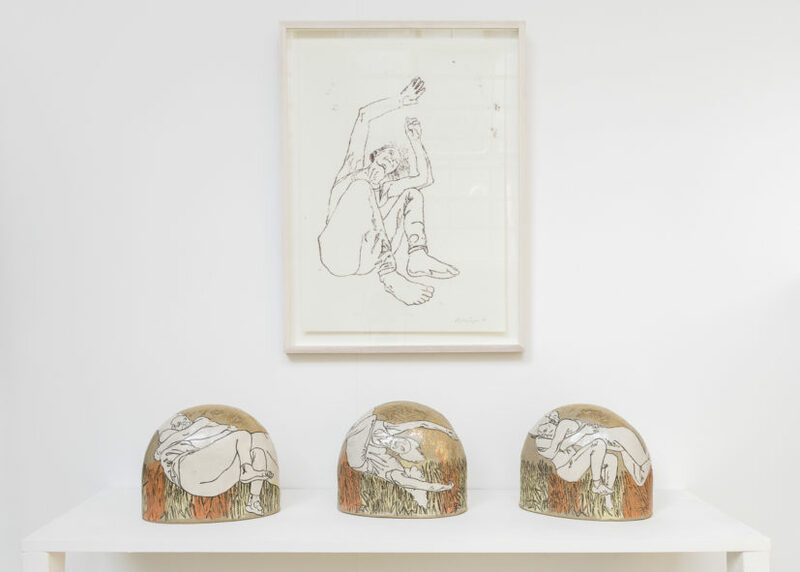 The theme is closely linked to the artist’s own experience of the inherent transformations – and spatial limitations – that come with motherhood. 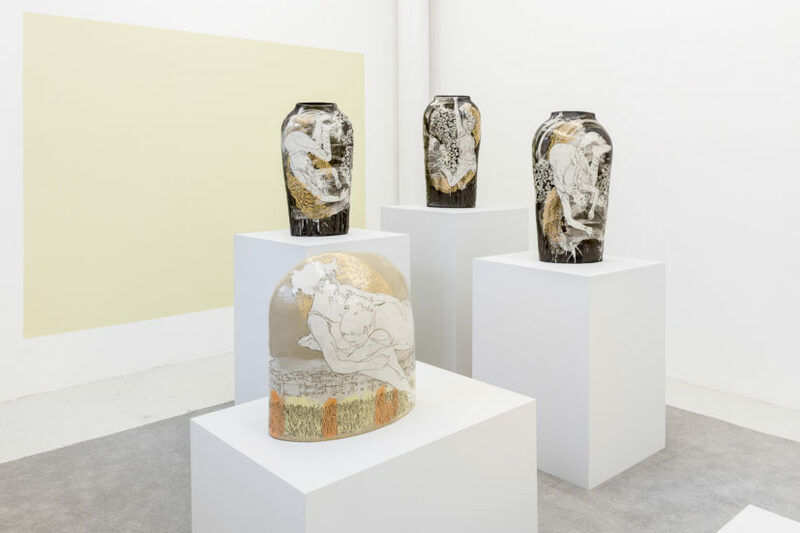 For this exhibition, Taylor has developed two different strands of objects: A series of elevated, torso-like vases displayed on tall plinths; and two abstract looking dome forms that are placed on lower grounded plinths. 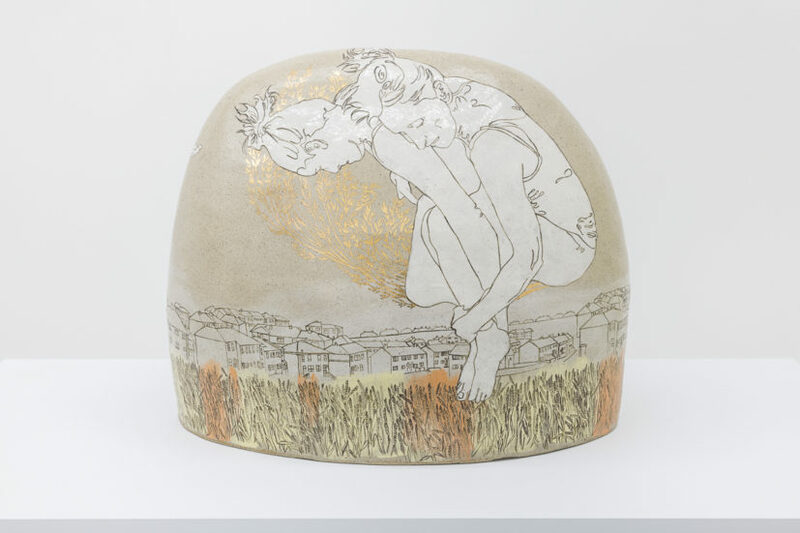 In her practice Taylor often combines classical and contemporary narratives, and these forms are inspired by ancient Kuduru, engraved stone-blocks used by the Kassites of Ancient Mesopotamia to mark land grants or boundaries. 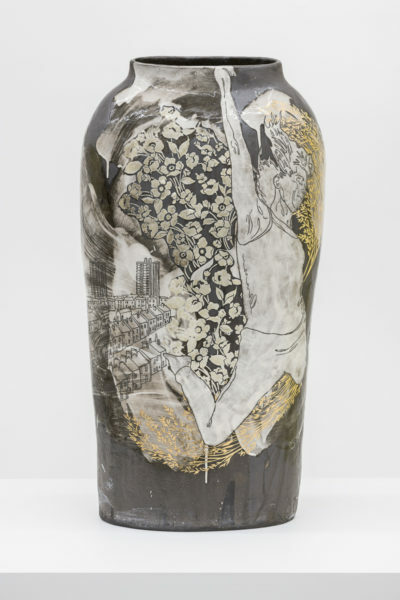 Both sets of ceramics show images of a new mother and an older woman, both aerial performers, with a cityscape of Victorian houses and council estates in the background. 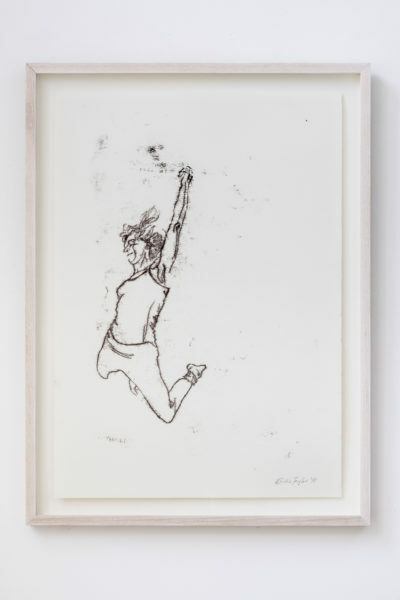 The artist met the younger acrobat in a playgroup that their children attend together and witnessed the first time she returned to the ropes since becoming a mother, performing with her post-birth body. 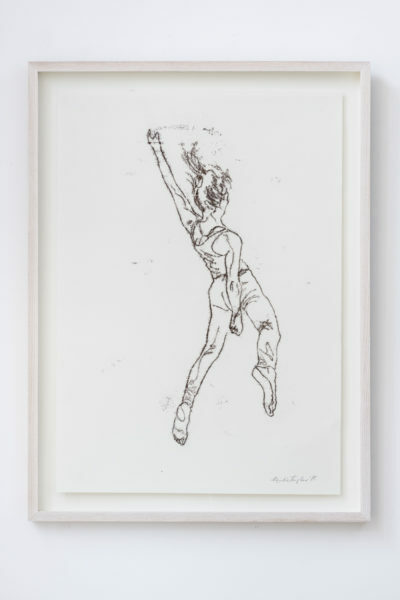 Taylor observed the movements of the older and the younger women suspended on ropes and in mid-air, making sketches and photographs. She then transferred these onto the pots and boulders. 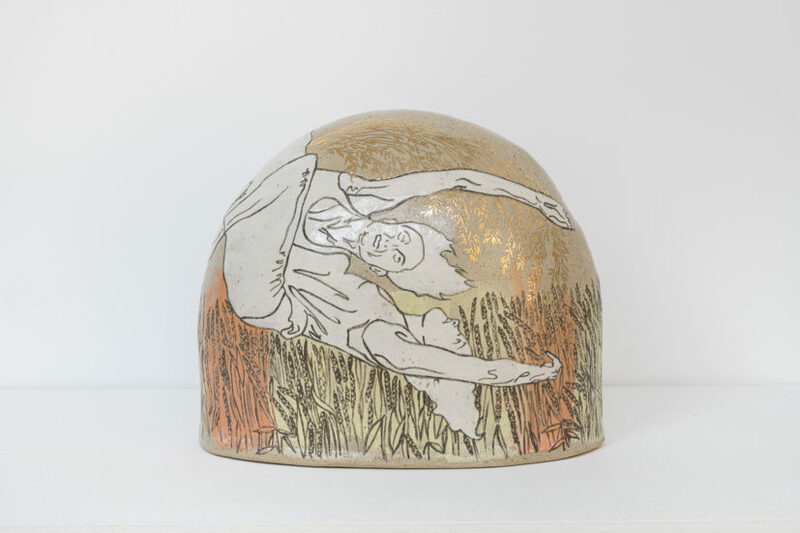 Taylor uses heritage craft processes, especially traditional slipware, to explore and interpret female experience in the urban landscape. 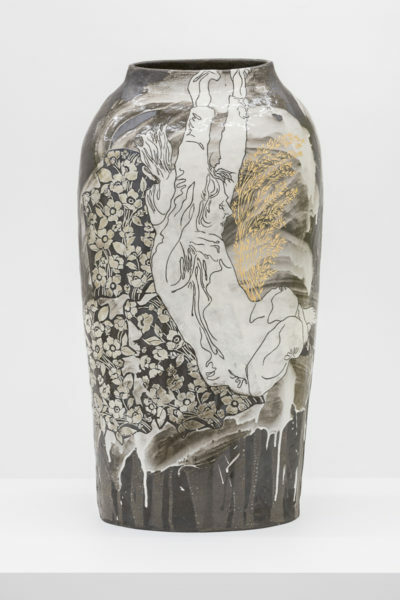 Her pots are hand-built using an iron-rich clay, first decorated with slip and then with drawings scribed into the surface. 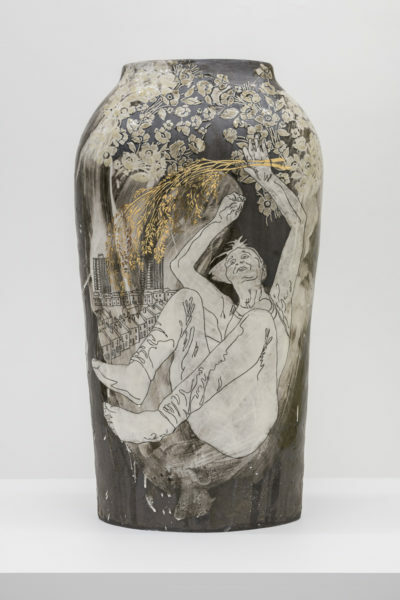 Next, the lines of the figures and landscapes are filled with iron oxide before the vessels are fired twice. Before the final firing takes place, Taylor applies transfers that have been screen printed in 9ct gold, taken from her botanical studies of corn and wheat. 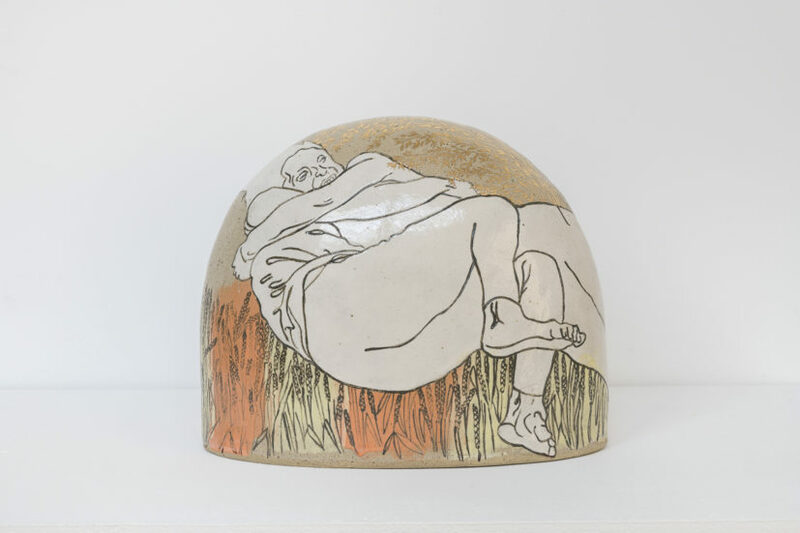 The imagery on the ceramic objects refer to the different stages of motherhood. The messier, more hectic seeming Torso pots show both women suspended in freefall. 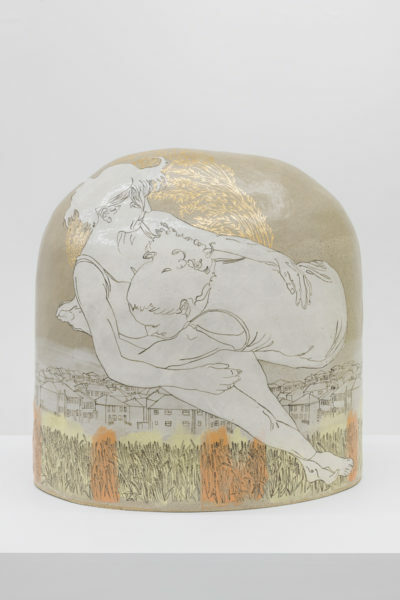 The heavy looking domes of the Boulder works then show a more grounded experience, where the new mother and the older woman embrace and support one another in a horizontal position. 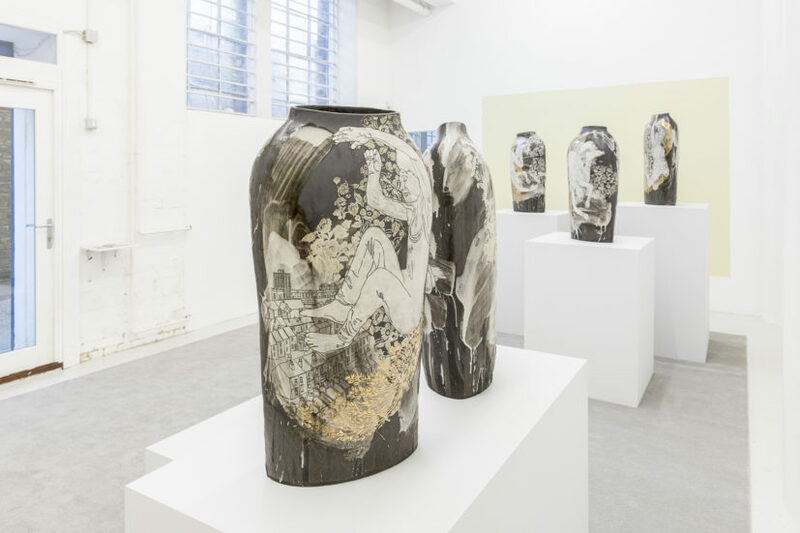 The staggered height of the plinths allows the viewer to get an immediate overall impression of the show, whilst also being able to move around the works. Two painted rectangles appear on the gallery walls, framing the vessels and enhancing the pale yellow of the boulders, and a square of grey carpet creates a museum-like atmosphere. 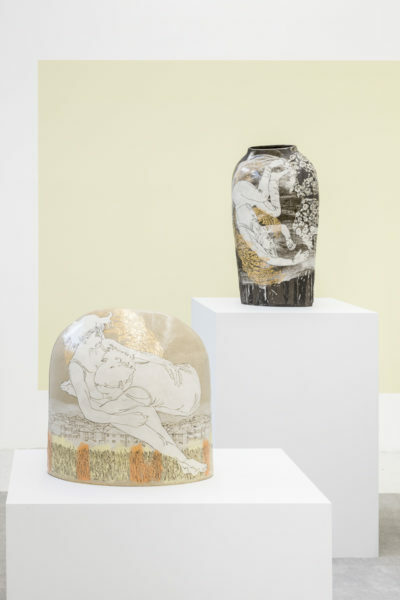 These angular shapes, along with the plinths, create a stark contrast to the organic forms of the vases, referencing the disparity between moving female bodies and the architectural background of the ceramic objects. Beating the Bounds is a brave exhibition: the maternal subject is still a contested site for artist-women to explore. It portrays the limitations that new mothers and older women often face in the public space in a subtle, but highly aesthetic and engaging way. 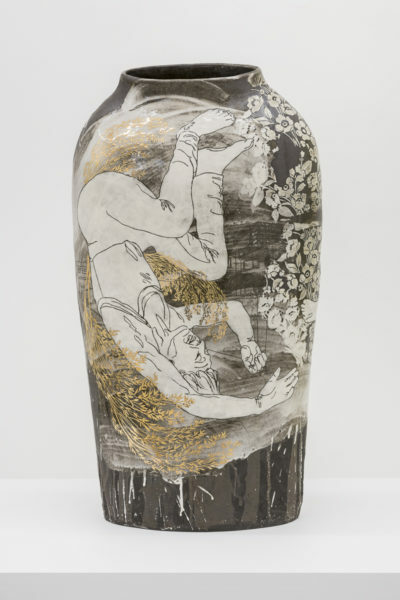 The exhibition also poses questions around the divide between art and craft. 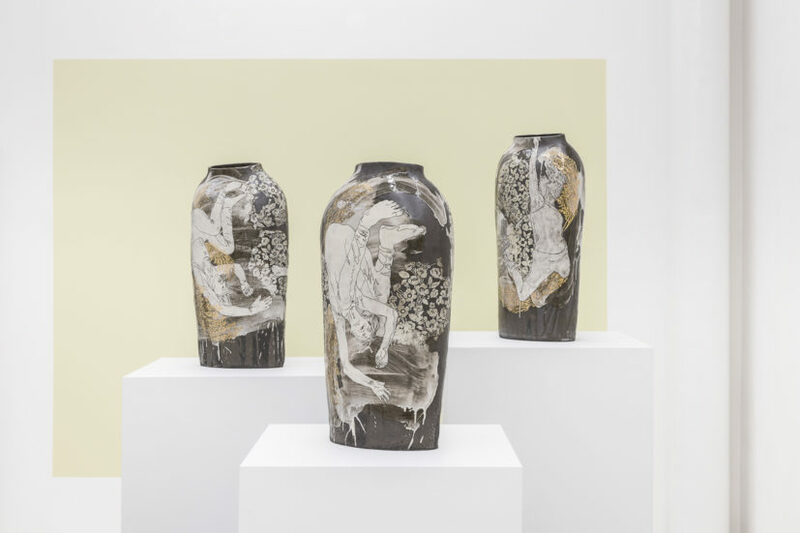 What lines are being blurred by bringing ceramic work, often identified as craft, into a fine art context? 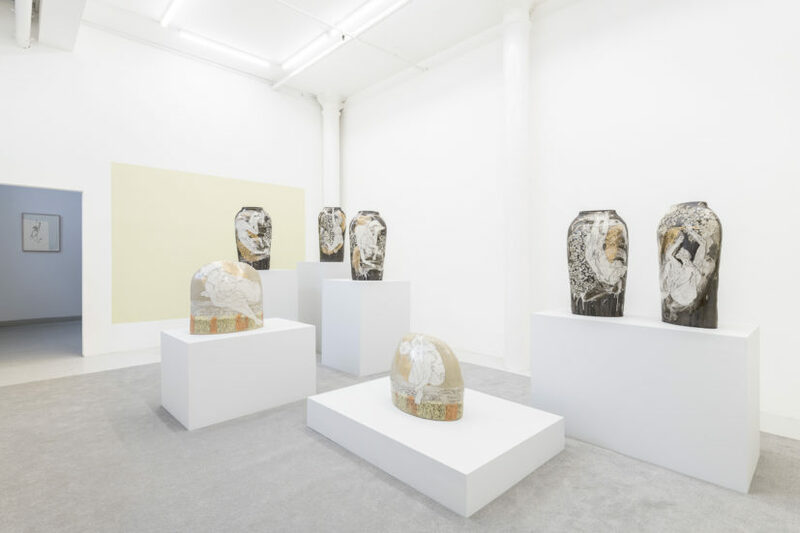 What boundaries are being pushed when a contemporary commercial art gallery presents craft objects in a museum-style presentation? If Peckham seems a little far for some, the Kiln Room opposite the gallery is holding a Christmas sale of ceramics this weekend. All the more reason to get down there and see this beautiful little show.